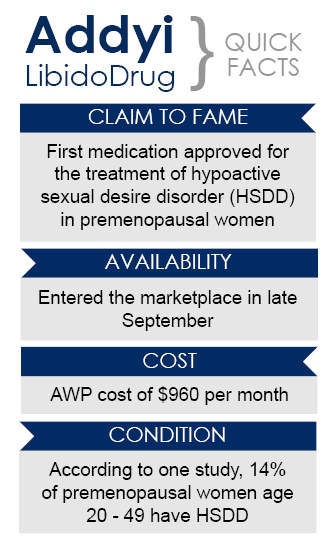 On August 18, 2015 the FDA approved Addyi, the first medication for the treatment of hypoactive sexual desire disorder (HSDD) in premenopausal women. This drug has been highly publicized in the media and is considered a major milestone in the advancement of women’s health. Since then, it has frequently been referred to as the “female Viagra®”, although its mechanism of action clearly demonstrates that this description is not accurate. HSDD is a deficiency or lack of sexual thoughts or desire that causes personal distress or interpersonal difficulty. It can be further classified as either situational (i.e. related to a specific partner or situation) or generalized. HSDD belongs to a broader classification of disorders referred to as female sexual dysfunction disorders. It is not indicated for and should not be used to enhance sexual performance. Although the product’s mechanism of action is poorly understood, animal studies suggest that Addyi alters neurotransmitter levels in the central nervous system. More specifically, serotonin levels may be reduced while norepinephrine and dopamine levels are thought to increase. It is for this reason that the media’s portrayal of Addyi as the “female Viagra” is inaccurate. Viagra provokes a physical response while Addyi provokes a biochemical or neurological response. Regardless of its mechanism, clinical trials studying this medication have demonstrated its ability to improve HSDD when used in specific patient populations. Like most drugs, Addyi carries the risk of adverse drug reactions or side effects. Addyi also has the potential to interact with other medications in a negative way. The consumption of alcohol in combination with Addyi is contraindicated and should be carefully avoided. Patients that consume alcohol while using this medication increase the risk of severe hypotension (a significant drop in blood pressure) and syncope (fainting). Other medications such as antifungals, antivirals, antibiotics, and grapefruit juice may also provoke the same reaction. The safety concerns associated with the use of Addyi, alone or in combination with other medications, require careful consideration by prescribers when evaluating candidates for this therapy. In regards to plan design, MedTrak recommends classifying all medications that treat sexual dysfunction disorders, whether male or female, into the same therapeutic category. Consequently, plans that currently include medications for erectile dysfunction should also consider including Addyi to maintain consistency within the prescription benefit in regards to this therapeutic category. Addyi may not be clinically appropriate for all patients. For this reason, MedTrak’s Clinical Care Center is currently evaluating the data surrounding this medication in order to assess the potential for applying Prior Authorization (PA) criteria to Addyi claims. If opportunities exist, MedTrak’s clinical pharmacists will work to develop approval criteria that ensures the safe and effective use of Addyi while simultaneously protecting the financial well-being of our Plan Sponsors. To discuss your Plan’s specific statistics and cost management strategies, contact your MedTrak Account Manager. FDA approves first treatment for sexual desire disorder. U.S. Food and Drug Administration website. http://www.fda.gov/NewsEvents/Newsroom/PressAnnouncements/ucm458734.htm. Published August 18, 2015. Accessed October 16, 2015. Abramowicz M, Zuccotti G, Pflomm J, et al. Flibanserin (Addyi) for Hypoactive Sexual Desire Disorder. The Medical Letter. 2015; 57: 133. Shifren J. Sexual dysfunction in women: Epidemiology, risk factors, and evaluation. UpToDate. Accessed October 16, 2015. Addyi Prescribing Information. Sprout Pharmaceuticals, Inc. Accessed October 16, 2015.